The arts have always been highly competitive, but today's market means it is tougher than ever to land just an interview. That is why your resume needs to outshine the competition by being creative, informative, and professional. When it comes to a great resume, it's about what you say and how you say it, meaning formatting is as important as the content you include. Looking at dancer resume templates is a great way to see what your resume needs. We offer a variety of the best templates that can get you started on the right track. Spend less time worrying about font size and paragraph spacing, and more time thinking about how best to describe your education, experience, and skills. What To Say in Your Resume? 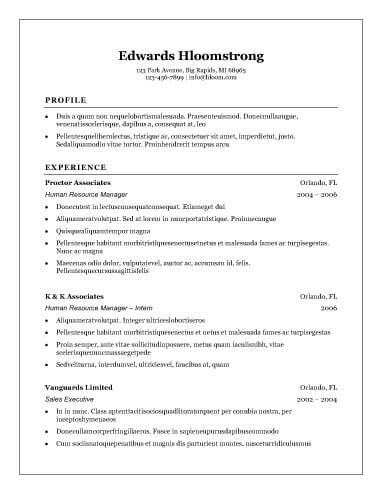 Why Use Dancer Resume Templates? Since format is just as important as content, you need to make sure your resume meets certain standards. Dancer resume templates help you to get started, and they come with many features to let you create a resume that is professional but also uniquely your own. With these benefits, your resume has a better chance to stand out. Are you interested in modern dance? Try a modern resume! Our extensive library of modern resume templates shows off the cutting edge of what a resume can look like. Be even more modern by taking advantage of other avenues to sell yourself, such as social media. Learn how to use all the tools available in the digital age to make a modern portrayal of yourself that goes beyond your resume. We've selected a few of the most popular resumes for you to peruse when choosing a format for your document. These are useful when you want your resume to feel like part of a group while adding personal touches to make it stand out. Because dance is so strictly choreographed, sticking out too much can be detrimental. When applying for your first job, it is important that your resume doesn't look bare. Since your work history will be short or nonexistent, it's important to spend more time on your education, skills, and awards. The design of our entry-level resume templates puts the focus on your best parts without drawing too much attention to your inexperience. Choose your favorite style and get started! A creative resume can highlight your artistic side, which can be a major bonus when seeking a job in the arts. Dancer resume templates with a bit of something extra, such as fun colors, fonts, and layouts, are where you should focus when going for the more creative side of resume making. In addition to using our templates, look at these five tips for making a creative resume without overdoing it. Dance takes many forms, and maybe the studio or troupe you are applying to could have a traditional mindset. Perhaps their dancers perform multiple classics throughout their season or have an old-fashioned work culture. Do some research into the company you want to join so you know whether traditional dancer resume templates are where you should start. Every little bit matters when putting together your resume, so double check that you include certain key components. When using dancer resume templates, we provide all the important sections. Here is a look at what you want to include in your document. Full name: This isn't the place to list your nickname or online handle. Instead, use your full, given name, no matter how embarrassing you may think it is. Home address: If you don't want to put your full mailing address, you can list the city and state you live in instead. Phone number: Some businesses prefer to contact prospective employees over the phone. List your phone number with the area code, especially if you've moved and have an area code outside of where you live. Email address: Check that your email address is professional and included at the top of your resume. Your email should use your name or something work appropriate. Clear and concise: This is often the first part of a resume a hiring manager will read, so it needs to hit your point quickly and clearly. Ideally, you should shoot for three bullet points or sentences. Action words: Make sure your statement is active rather than passive. Describe what you can do and have done, not what you hope to do. Add keywords: This part comes from researching the studio or troupe you are applying to. Find out everything you can about the culture of that workplace and use keywords that make you a good fit. Read the job description: Use the job posting to inform the kind of skills you need to include in your resume. However, don't add anything that isn't true. Simplicity: Keep your skills between one and three words. Instead of saying "able to arrive on time every day," try "punctual" or "great time management" instead. Chronologically in reverse: Always start with your current job or degree and go backwards from there. Consistency: Format all your past jobs in the same way. Likewise, if you have more than one degree, list the same kind of information for each one. A resume builder not only saves you time but helps ensure consistent formatting. With our popular resume builder, you can start your resume and compare it to a variety of dancer resume templates. Here are some of the great benefits of using this resume builder. By choosing our resume builder, you are already well on your way to improving your chances for an interview.